MIAMI, FL – On Wednesday, March 7th, Bilzin Sumberg hosted nearly 40 students from Coral Gables Senior High School during a full-day legal education conference in connection with the Fourth Annual NALP/Street Law Legal Diversity Pipeline Program, a multi-week initiative which focuses on minority high school students with the goal of encouraging them to pursue a career in the law. 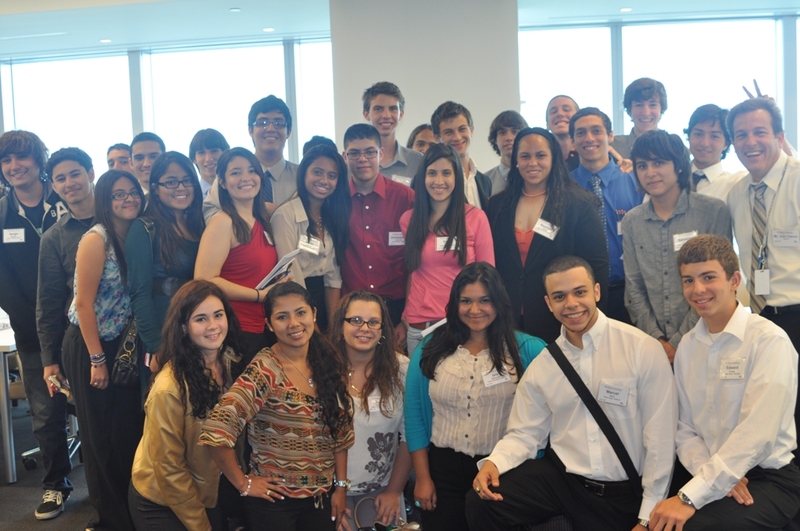 The Pipeline Program, which is a joint partnership between the National Association for Law Placement, Inc.® (NALP) and Street Law, Inc., partners selected law firms with nearby, diverse high school law classes in an effort to provide engagement and education between aspiring law students and real-world legal professionals. Only nine law firms in the country were selected to participate in the Diversity Pipeline Program; Bilzin Sumberg is proud to support this effort for a fourth year in a row. During the multi-week Diversity Pipeline program, Bilzin Sumberg taught juniors and seniors enrolled in law classes about Real Estate Negotiations, Cyber Bullying and Mock Trial Litigation. Bilzin Sumberg professionals also provided one-on-one mentorship and career advice to students who have an interest in pursuing the legal profession post-high school graduation. The conference reinforced lessons learned during the multi-week program and included a career fair for students to explore the wide array of jobs and practice areas in the field of law; interactive workshops, and a first-hand glimpse into the behind-the-scenes functions that are necessary for a law firm to operate. The Diversity Pipeline Program serves an important component in the movement to increase representation of women and minorities in the legal industry. By providing students the opportunity to participate in real-world legal situations and learn about the law from local legal professionals, the program opens young people to the possibility of a legal career and provides resources to pursue that path. Bilzin Sumberg’s participation in the Legal Diversity Pipeline Program is one of many pro-bono and charitable projects under the firm’s community outreach program – Bilzin Sumberg Cares. Bilzin Sumberg Cares is a volunteer employee-based community program and the first and only of its kind in the South Florida legal community. Springing from the firm's desire for the "Bilzin Sumberg Community" to positively impact the community in which Bilzin Sumberg employees live and work, the program has created the opportunity for attorneys and staff to work hand-in-hand to help shape the local community. The National Association for Law Placement (NALP) is a nonprofit member association dedicated to continuously improving career counseling and planning, recruitment and retention, and the professional development of law students, lawyers, and its members. Founded in 1971, NALP’s membership includes every ABA-accredited law school and over 1,000 employer organizations, ranging from law firms to government agencies and public interest offices. For more information, please visit www.nalp.org.